Since the PT Cruiser is based on the same chassis as the Chrysler Neon, it shouldn’t surprise me that it classifies as a compact car. Accordingly, I wasn’t expecting much in the way of interior room. As expected, the front seat isn’t cavernous, but it wasn’t impossible to live with. Likewise, it has all the get-up-and-go of… well… a Neon (which is to say, not much). The styling of the interior was an odd combination of “retro” and “art deco.” Textures and materials seemed in conflict, and style seemed unevenly reminiscent of many of the worst interiors in years past. Perhaps the biggest surprise/disappointment was the lack of cruise control! (This must have been a PT Non-Cruiser!) If I were Chrysler, I would be very reluctant to put a vehicle so-equipped into a rental fleet. Making matters worse is the actual seating position. I constantly felt that I was about to fall off of the driver’s seat. I doubt that Chrysler is likely to need any rollover testing in this vehicle, because the driver is likely to fall off the seat before the g-forces are high enough to cause a roll (or even a slide). There are no side-bolsters to speak of, and the seat has a crowned feeling that (for me) was inescapable. 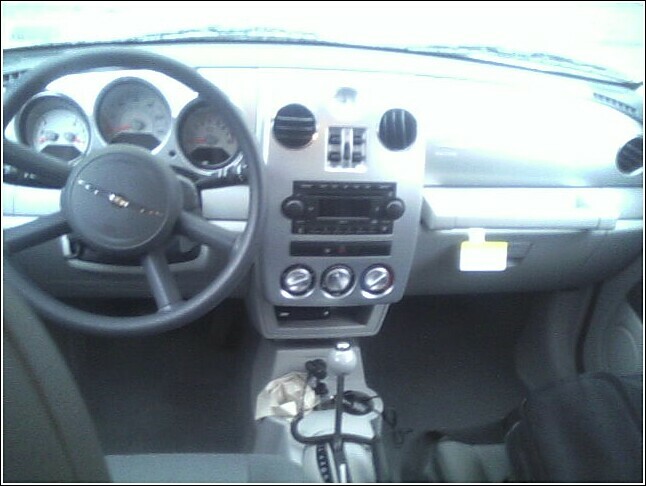 As you can see from the pic above, there isn’t even sufficient space to put my laptop behind the driver’s seat. This forces me to move it to the opposite back seat, or put it up front with me. It’s just a pain. Now, at this point, you may be thinking that I didn’t like anything about this car: Odd styling in the front interior, poor seating position, lack of room in the back, and so on. In spite of all these shortcomings, there were a couple of things that I really liked about this car. 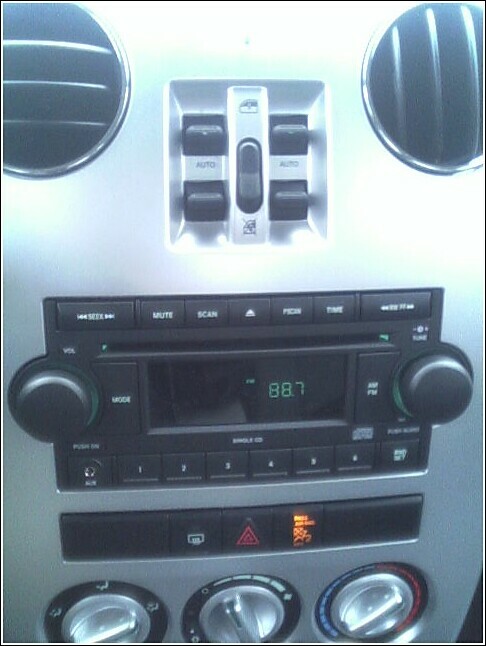 The first was the fact that the radio had a Aux jack on the front! Had I known I was getting this vehicle, I could have brought along a patch cord and plugged my iPod directly into the radio instead of going through the static-ridden FM transmitter. This is a very cool thing for a rental car! Second, the cupholders at the front of the transmission tunnel are lit with soft blue lighting when the dash lights are on. This saved me from having to blindly search for change as I approached one of the many Toll booths in the New England region one evening, and made it much easier to find my quad con panna in the dark of night. Lastly, the visibility out of the rear quarters was much better than I expected. Within minutes of hopping in the car, I was trying to merge into traffic with cars fast approaching the passenger-side blind spot. Because of the rear A-pillar design, there really is no blind spot in this car. The jury is still out for me on the position of the power window controls (just above the radio). I can see the value of putting them there, as either passenger has easy access, but it is so non-standard, it just smacks you in the face with… odd. 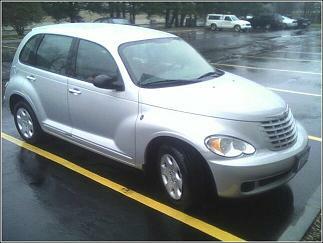 In summary, I would be hard-pressed to buy a PT Cruiser. Even if I could forget how strained the engine sounds, the nice exterior styling wouldn’t be enough to make me forget that I was basically driving a two-seater with a big, open trunk. 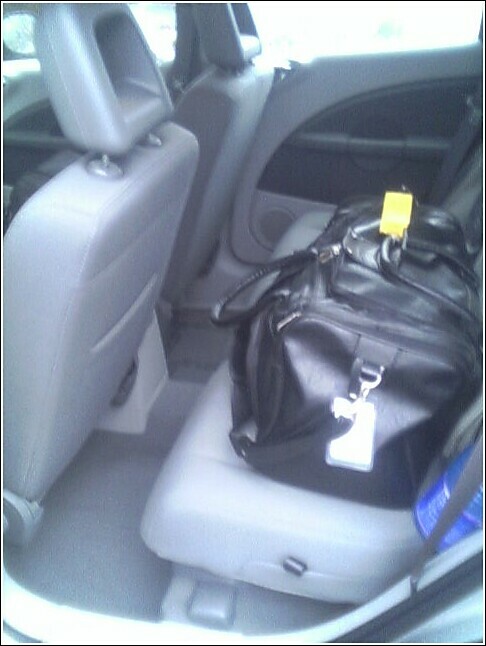 i thin you should modernize your laptop.. a so big bag does not contains only your laptop… when i make travel with mine, i install the luggage in the trunk not on the rear seat. I made a lot of travel with different size of passenger in the back and all time the poeples say me than the are suprise with the room for leg and the dont have the head tight on the roof, i suppose your kids are very impressives. Keep in mind that this was written four years ago. I’ve since modernized my laptop several times, and now tend to travel with an iPad, which even the PT Cruiser would allow behind the driver’s seat. As for my sons being impressive, my oldest has size 17 (US size) feet, so even if he wasn’t 6’3″, his feet probably wouldn’t fit. My older son is 6′, so he wouldn’t fit either. I don’t know if that’s impressive or not, but it’s not quite sized for the PT Cruiser.